There was an old wartime saying about ‘careless talk cost lives’ well, I seem to find myself turning that on its head to Careless Talk Saves Lives. You see, last week I rather casually quipped on Twitter that if we won the East of England Co-Op’s Producer of the Year award – which is voted for by the East Anglian public – that I would push a barrel of our Fred’s Check charity ale the 201 km from the brewery, in Hindringham – to St Barts Hospital, in central London. The aim being to raise awareness for local testicular cancer charity Its On The Ball and also the great oncology and support team at St Bart’s. 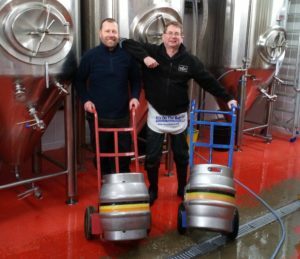 To be honest it was a safe shout, as in the voting we are up against Woodforde’s Brewery who are about 15 times our size and, quite frankly a Norfolk institution. The trouble is once it was out there a few people commented it would be an awesome thing to do, and there were a couple of offers of help. Appropriately you could say here at Moon Gazer – the hare was running. So, to cut to the chase we are going to commit to carrying out the challenge. There is a lot of planning. For starters choosing a route which is safe to push the barrel along – not sure the authorities will like to see me pushing beer along the M11 – so the 201km may become considerably longer. Then there’s all the things we need to do along the way – calling in to schools or sports club to chat about this killer disease. If we can do that we can save lives, as 98% of testicular cancer can be cured if caught in time – the trouble is not enough people know about it – and that’s why the small, dedicated team at It’s On The Ball do so much to help raise awareness. So, the aim is to schedule the push for March 2020. You can help too – as if you are reading this you now know about testicular cancer – so all that you have to do is tell the next person you see and they will know too! How beautifully simple is that. Like I say there is so much planning to do, but of you did want to help, either in pushing, providing support, helping with overnight stays or anything really, then do get in touch. We’re even seeing if the brewery’s local MP, Norman Lamb can arrange something at parliament as well – nothing agreed yet, and it may not be possible, but it would be a fitting testament to the charity if we could raise a glass of Fred’s Check Tobi’s Tipple in Westminster. If by the way – going back to the original premise of the challenge – you can vote for us in the awards www.eastofengland.coop/poty2019 #POTY2019 it might help take away the thought of the blisters which are sure to come.